This is an interdisciplinary research group that aims to contribute to critical analyses of the politics, international relations and political economy of the Middle East and North Africa. Members’ research interests include traditional and critical security issues, the impact of globalisation on the region, energy and environmental resources, political revolutions, conflict resolution and crisis management, and development. This cluster forms part of the Politics and International Relations Academic Team. The group's research explores historical and contemporary events, issues and processes that inform the politics, international relations and political economy of the Middle East and North Africa. Its members draw upon an eclectic range of methodological and theoretical approaches to analyse the complexities of one of the most widely reported, yet perhaps least understood regions of the world. Our research benefits from expertise in different fields, with scholarly work in International Relations, Politics, History and Business coming together to form a heterodox research environment. A series of workshops, seminars and conferences hosted by this group brings together a network of established scholars along with early-career and postgraduate researchers who investigate various aspects of the modern Middle East and North Africa. Our research has been funded by various academic associations and public institutions including the International Studies Association, the British Academy of Management and the Libyan Ministry of Higher Education. Work produced by the group has appeared in international journals such as the Journal of Developing Societies and the Journal of Conflict Transformation and Security, as well as published monographs with leading publishing houses including I.B. Tauris and Routledge. 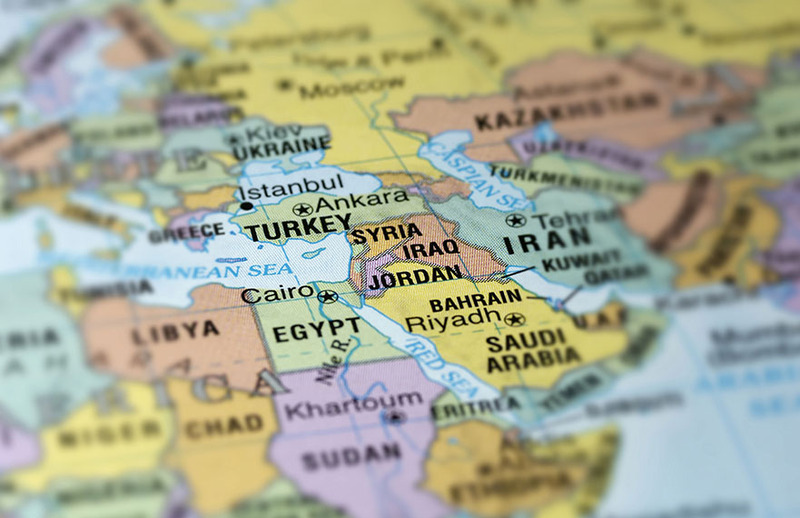 In what may be termed the Post-Arab Spring era, the Middle East and North Africa is experiencing unprecedented national and transnational challenges. The conference will consider a range of political, economic, security, socio-cultural and environmental issues that lay at the heart of the instability the region is experiencing. The British Academy of Management. El-Anis, I., 'Explaining the Behaviour of Small States: An Analysis of Jordan's Nuclear Energy Policy', Cambridge Review of International Affairs (forthcoming in 2015). Underhill, N., 2014, Countering Global Terrorism and Insurgency: Calculating the Risk of State Failure in Afghanistan, Pakistan and Iraq, Basingstoke: Palgrave Macmillan. El-Anis, I., 'Interests, Perceptions and Security in US-Jordanian Nuclear Relations', Journal of Developing Societies, Vol. 30, No. 4 (Winter 2014), pp. 459-482. El-Anis, I., 'Freshwater Scarcity, Interdependence and Institutionalism in Jordanian Foreign Policy: Towards Conflict or Cooperation? ', in Perceptions: Journal of International Affairs, Vol. 18 (Winter 2013), pp. 195-213. Hamed, E. and Arthur, L., 'Entrepreneurship in SMEs through Business Incubators in the Arab World (Case Study of UAE)', in International Journal of Innovation and Knowledge Management in the Middle East and North Africa, Vol. 2, No. 1 (Winter 2013), pp. 21-37. Joharchi, S., 'A Tacit Alliance: The Political Economy of Chinese-Iranian Relations', in The Maghreb Review, Special Issue (Winter 2013). Ali, S., Raiden, A. and Kirk, S., 'Wasta in the Jordanian Culture: a Study in the Banking Sector', inInternational Journal of Innovations in Business, Vol. 2, No. 6 (2013), pp. 529-550. Hamed, E. and Arthur, L., 'Obstacles to Innovation Faced by Small and Medium Enterprises in Libya', in International Journal of Innovation and Knowledge Management in the Middle East and North Africa, Vol. 3, No. 2 (Summer 2013), pp. 21-37. El-Anis, I. and Hamed, A., 'From Spring to Summer? Revolutionary Change in Tunisia, Egypt and Libya', Bilgi Journal, Vol. 27 (Winter 2013), pp. 75-102. El-Anis, I. and Hamed, A., 'Libya After the Civil War: Regime Change and Democratisation', in The Journal of Conflict Transformation and Security, Vol. 3, No.2 (Autumn 2013). El-Anis, I., 'A Review of Trade Liberalisation and Trade Between Jordan and the United States', in The International Journal of Peace and Development Studies, Vol. 4, No. 6 (October 2013), pp. 116-124. El-Anis, I. and Smith, R., 'Water Security, Conflict and Cooperation: the Case of the Red Sea-Dead Sea Conduit Project', in The Journal of Developing Societies, Vol. 29, No. 1 (Spring 2013), pp. 1-22. El-Anis, I., 'The Political Economy of Energy Security and Nuclear Energy in Jordan', in The Central European Journal of International and Security Studies, Vol. 6, No. 1 (Spring 2012), pp. 13-35. El-Anis, I., '(Dis)Integration and the Emergence of the State System in the Middle East', in The Journal of Global Analysis, Vol. 2, No. 2 (Summer 2011), pp. 9-28. El-Anis, I., 2011, Jordan and the United States: The Political Economy of Trade and Economic Reform in the Middle East, London: I.B. Tauris. Regional economic integration has long been a policy objective of governments in the Middle East and North Africa and has led to the development of a number of bilateral, multilateral and region-wide projects. In particular the creation of preferential trade agreements in the form of free trade agreements (FTAs) and economic unions have sought to facilitate intra-regional trade and promote economic productivity in member states (in other words trade creation and not trade diversion). Many existing studies have sought to analyse the effectiveness of these policies in terms of their impact on economic development (which has been widely seen as the driving force behind these agreements) by using various methodological approaches that have favoured quantitative methods and positivist analysis. This project seeks to develop our understanding of the interests driving these policies, as well as their effectiveness in both economic and political terms. Using a mixed methodology and institutionalist theoretical assumptions this project explores the integrative impacts of various agreements, such as the Greater Arab Free Trade Area, on political and economic relationships. This project investigates the impact of globalisation on national and regional hydrocarbon and financial sectors in the Maghreb by addressing several key questions pertaining to the regional impact of global energy and financial structures. This project also explores the nature of the globalisation of regional processes and infrastructures in the hydrocarbon and financial sectors. The Maghreb is increasingly becoming integrated into global energy and financial markets and this is leading to rapid and over-arching changes in the ways these sectors operate at the national and regional levels. Understanding and developing policy responses to this process of regional penetration and global integration are increasingly important in the post-2011 era, and as such, this project develops and disseminates policy recommendations to both academic and governmental audiences. This project examines the underlying causes of the enduring crisis in Darfur by analysing historical and contemporary internal and external factors that have underpinned various options and choices of governmental and non-governmental bodies in crisis management since 2003. The project also explores how improvements in national and international governmental crisis management techniques can be utilised to resolve the Darfur crisis in the future and what this case can tell us about crisis management in other similar conflicts. This project focuses primarily on the Special Tribunal for Lebanon, a hybrid, ad hoc court of 'international character' set up to prosecute the murderers of Rafik Hariri (the assassinated former Prime Minister of Lebanon). The project investigates the dynamic interactions of state and non-state actors through a multi-level/cross sectional analysis, from the juridical institutions and organs of global world order, through regional inter-state and geopolitical interactions, down into the state-society complex. The thesis therefore draws on multiple disciplines from Ethnography to International Relations and Law in order to assess the function and impact of the institution on the likelihood for peace and justice in Lebanon and the Mashreq. Theoretically, this project uses conceptions of different forms of power and hegemony and their utility in different contexts (consent / coercion, material / normative) and of forms of (in)security (physical / ontological). This project investigates the political economy of contemporary Iranian-Chinese Relations. It assesses bi-lateral relations between the two states in the absence of a formal alliance and seeks to offer conclusions as to the extent to which this relationship can be classed as a tacit alliance. This is done by focusing the analysis on the impact that domestic, regional and international processes have had upon the evolution of political and economic relations between Iran and China since the 1979 Iranian Revolution. In doing so it builds upon the seminal works of Sylvia Crosbie (1974), Coral Bell (1977) and Polakow-Suransky (2010). This study uses a Constructivist methodology and draws on 'Trust and Risk' security assessments to argue for the recognition of the role that rhetoric play in constructing and reinforcing perceived norms, values and identifications which underpin assessments of trust and risk (and foreign and economic policy more generally). The purpose of this project is to analyse various aspects of the contemporary security system in the Gulf region and to explore the potential for future changes in this system and subsequent impacts. The framework of study for this project allows for a critical re-assessment of the perceptions that states in the Gulf have of each other’s roles in the regional security system as well as that of the USA as the extra-regional hegemon. To achieve this aim, this study firstly analyses the role of the USA in light of the transformations in both US policy (as the focus of US security policy shifts ever more to the Asia-Pacific) and military deployments (in particular with the withdrawal of US military forces from Iraq in 2011). The project also analyses domestic policy-making processes in the Gulf countries (Bahrain, Iran, Iraq, Kuwait, Oman, Qatar, Saudi Arabia and the UAE), security dynamics in the regional system, and cognitive and psychological factors in the policy-making circles in these governments to understand their interests and policy-making mechanisms. This research project focuses on the impact that foreign economic aid has on domestic and foreign policy-making in small states by investigating the degree to which the Hashemite Kingdom of Jordan (as a small state) is economically and politically dependent on foreign aid, and in particular on US aid. It examines the impact that this dependence has on the formation and evolution of Jordanian foreign and domestic policy-making processes by exploring bureaucratic politics and cognitive processes in centres of decision-making. The project examines the link between foreign economic aid and Jordanian economic development, national budgetary security, regime stability, and key domestic and foreign policy decisions. In order to explore the ability of small states to insulate their policy-making processes from external pressures, the measures taken by the Jordanian government to lessen the impact of U.S. aid on Jordanian cultural and historical dimensions as well as governmental and societal structures. This project seeks to contribute to the limited body of work on the impact of foreign economic aid on small states (and Jordan in particular) through a mixed-methods approach that utilises in-depth structured and unstructured interviews, surveys and participant observation amongst others. Using a combination of Constructivist theory and the work of Pierre Bourdieu this project seeks to deconstruct the securitising practices of the UK government and the EU as a whole with regards to the movement of people via North Africa into the EU. The central concern of this study is to investigate how both actors are different and / or similar and to examine the multifaceted processes and mechanisms that have produced contemporary migration control policies in the EU and the UK. These issues are analysed by using qualitative coding practices in order to deconstruct migration policies, as well as other policies which relate to migration, such as the European Neighbourhood Policy. The relationship between the UK and the EU is of great importance here and in particular the question of whether the UK's securitising practices are 'in line' with the EU's is explored. Political upheavals such as the recent Arab Spring revolutions highlight the differences in the way EU member states react to immigration. One certainty is that the securitisation of migration is the most important factor within the politics of migration in the southern EU and North Africa region. The examination of securitising agencies such as the UKVI and FRONTEX and how they contribute to the formation of policy-making illustrates the deconstruction and the reconfiguration of Europe’s southern border into North African territory. This project explores the (re)structuring of sovereignty in the UK and the EU by analysing the relationships between the EU, the UK and other member states and North African states. By analysing this (re)structuring the project seeks to demonstrate whether changes to sovereignty are simply an evolution of current and historical structures or whether the EU and its member states are reimagining the union’s southern border. The general research aims of this project are to study the effect of key changes in the global order and in Libyan politics during three stages of the Cold War: namely, following the 1969 revolution that brought Muammar Gadhafi’s revisionist regime to power, the following decade when relations between Libya and the international community were being shaped, and the latter stages of the Cold War in the late 1980s and the start of the post-Cold War era in the early 1990s. For each period of time under investigation the project examines changes at the international level of analysis and subsequent impacts on Libyan national security, economic development and political stability on the one hand, and foreign policy-making on the other. A mixed-method approach is utilised including extensive national archival work being conducted in the UK and Libya, content analysis of media coverage, and a series of in-depth interviews with relevant public and private stakeholders in several countries. This project investigates the impact of Jordanian culture on the transfer of western recruitment and selection policies and procedures to Jordan. The focus of this research is on a cultural concept called Wasta. Wasta in the Arab world can be explained as favouritism based on Tribal and family affiliations; this is manifested in several human resources and employment processes such as recruitment, selection and employee promotion. The importance of this research to the human resources knowledge comes through the analysis of the effects of this nepotistic practice on the concepts of diversity and equal opportunities in the workplace. The research is being carried out with the Jordanian banking sector as the primary focus.